Early this evening Alessandro and I walked up to Piazzale Michelangiolo to take a few pictures. We wanted to arrive before the sun set to see if the light was any better than the other day when I went up alone. The parking lot had many cars and a few people were standing outside eating gelato (ice cream). This morning I headed out of our apartment and walked up the wide steps to reach Piazzale Michelangiolo. I had been wanting to go up there to take some pictures and when I saw that the sky was clear, I thought that it'd be perfect. I expected to see more people taking in the view, but there was only a handful of us. A couple of vendors have set up their stands to sell drinks, souvenirs, tee shirts, and scarves. I walked to the corner closest to the Duomo and took a few shots. I wasn't that pleased with the late-morning light as the city below appeared a bit hazy. If the aperitivo tonight wasn't held at the Four Seasons, I don't know for sure if I'd have gone. 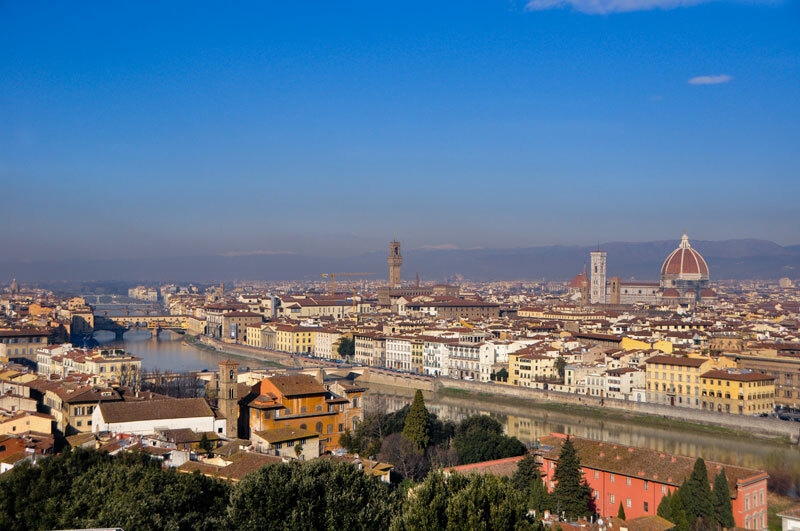 A young fiorentino, Matteo Renzi, is casting his bid to become the next sindaco (mayor) of Florence, and he has invited the active, but little recognized, minority of English-speaking residents. For a dinner at a friend's house tonight, I decided to go to a pasticceria (pastry shop) to buy a torta (cake). The weather looked a little iffy this morning, so I ran out as soon as I could to find an open pasticceria. I had a few ideas in my head of where I wanted to go, but I wanted to stay close by. 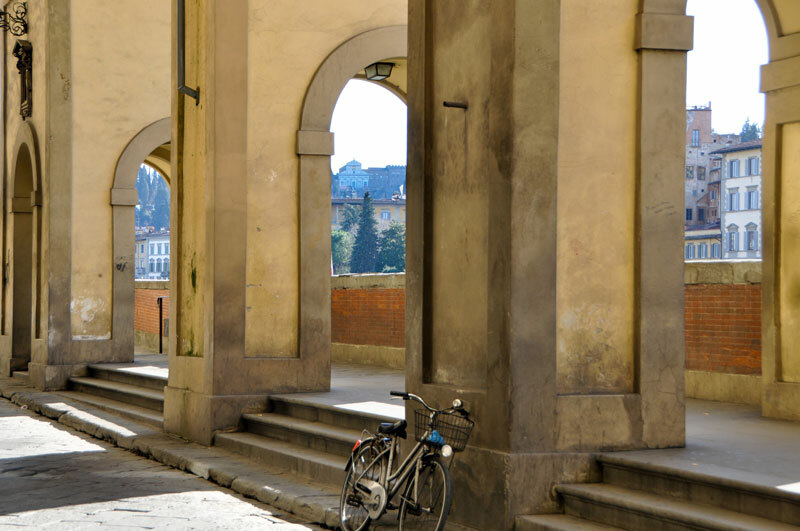 I headed along the lungarno (street that runs along the Arno) toward the Ponte Vecchio because I wanted to try a pasticceria that I had heard about. Every day this week as I walked past Santa Croce, I saw men working on the building that would house the many bancarelle (stands) for the Fiera del cioccolato. I wanted to go as soon as it opened on Thursday, but I didn't have a chance. I wanted to go before Sunday because that's usually the busiest day for the fiera because many people go for a passeggiata (walk) around town. I didn't go Friday because it was raining, so my only day was today. I have been looking forward to Tuesday for quite a while. I heard that there might be a few celebrations in town, but I knew that I wanted to watch Barack H. Obama's inauguration alone. I turned on CNN early in the day to watch the countdown to the inauguration. I have only watched CNN once since I've moved to Florence and that was to follow the election results last year. I don't remember ever being this excited about watching the inauguration of our new US President. While I watched the Mall fill up with millions of people, I felt a great desire to be in the US. One of the things that continually surprises me here is how people seem unconcerned about money. Sometimes I only carry a little coin purse to do my shopping so when I go to certain negozi (shops) where they know me, I can understand that when I don't have the money to pay my bill that they tell me to bring it to them the next time. I find it interesting though that each time I return to give them the money I owe, they just slide it into the till and thank me. They rarely check to make sure that I gave them what I owed. One woman I paid back didn't even remember that I owed her money, and argued with me that I must have been mistaken. It wasn't a lot of money, but I made sure she kept the 2 Euros I know I owed her. 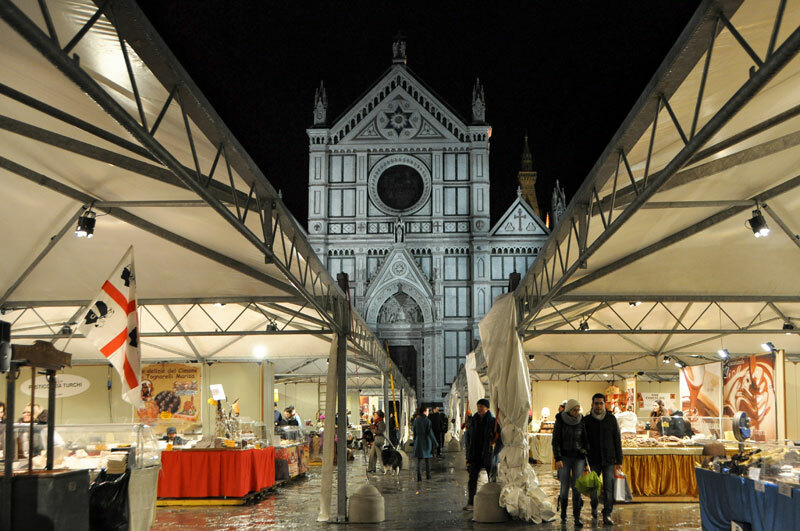 When I was taking photos at the mercato di Sant'Ambrogio (Sant'Ambrogio market) for an article on my website Florence from the Heart, a few people that I buy food from were curious about the photos I was taking. They usually saw me as a customer and didn't know about my love of the city. 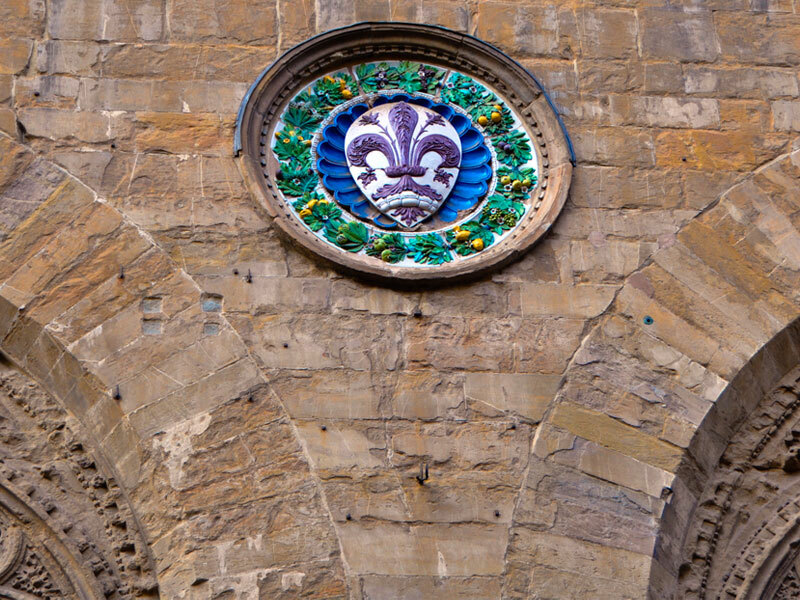 I spoke with one ortolano (greengrocer), Fernando, who told me about a friend of his, Luca Giannelli, who publishes books about Florence, its history, and also about the Fiorentina (Florence's soccer team). He told me that he could introduce me to him if I wanted. The first time he mentioned it, I had assumed he was being nice and didn't take his offer seriously. When I looked outside the windows, I saw the sun shining in a clear blue sky. I quickly got myself ready and decided to go out for a passeggiata (walk). I head down the lungarno toward the Ponte Vecchio along the narrow marciapiede (sidewalk) next to the Museo di Storia della Scienza. 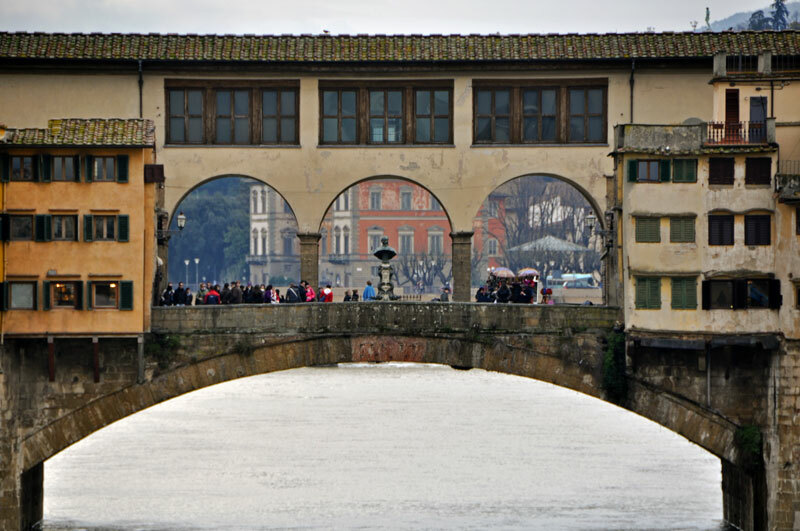 I go toward the small outlet across from the Uffizi where people usually get a view of the Ponte Vecchio. As I approach the outlet, I watch people dash across the lungarno to avoid the oncoming cars. When I am working at my computer in the early evening, I usually miss the tramonto (sunset). I sometimes catch a glimpse of it from the window of our apartment, and watch the cielo (sky) change color. A few times the colors were so amazing that I got up from behind my desk and walked to the window or up to the terrazza (terrace) to have a better look. So yesterday I decided to try to catch the tramonto on my way over to a shop in San Niccol�. Today after I had a caff� (coffee) with a new friend, I was walking downtown about to run a few errands, and I stopped in my tracks when I found myself standing next to Orsanmichele chiesa (church). I remember the first time I stumbled upon the chiesa the first weekend after I arrived in Florence. While I sat inside admiring the interior, I realized that I was finally home. 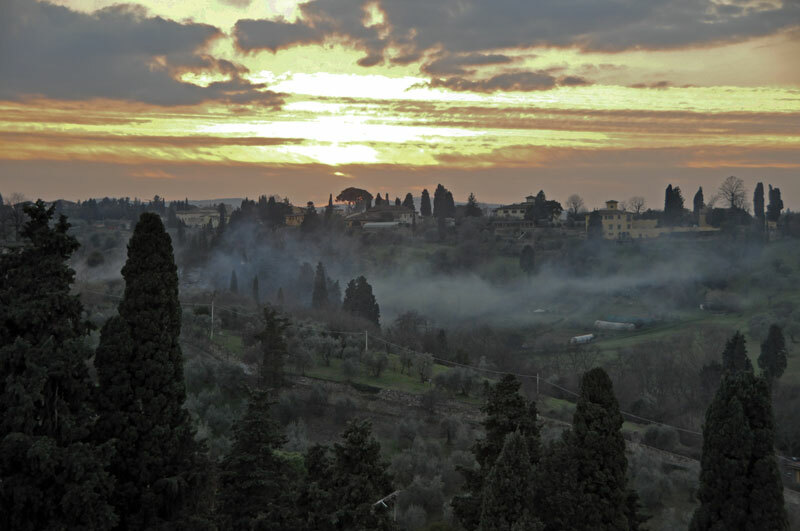 In that instant I decided that I would live in Florence. After Natale (Christmas) and the Nuovo anno (New Year), the final festa (holiday) that remains is Epifania (Epiphany) on January 6th. In three weeks, we celebrate three feste, which is exciting and yet a lot all at once. The Epifania is mostly a festa for children these days, but it's a good excuse to have a big lunch with the family. 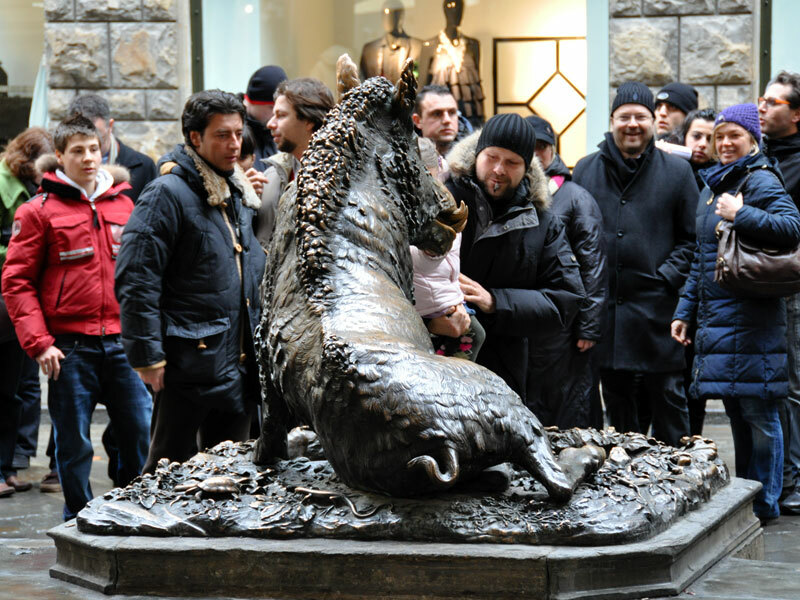 In Florence, the Epifania is probably more important than in other cities because the day after this festa is when all the saldi (sales) begin and last for almost six weeks. Today when Alessandro and I checked the buca delle lettere (mail box), which is just a slit in the portone (door) to our building, we found a portafoglio (wallet). The first thing we did was look at the documenti (papers) to see who it belonged to. I imagined it was someone who lived in our building, but we quickly found out that it belonged to a woman living near Pavia, which is in the north of Italy. Someone must have stolen it and discarded the portafoglio so that someone else would take care of returning the person's documenti to them. 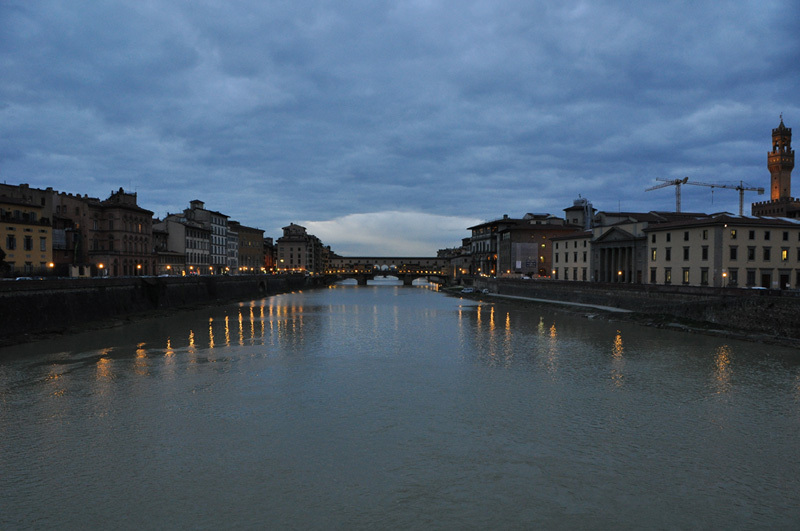 Early this morning as the sun was rising slowly behind the dark, thick clouds, men in orange rain suits were sweeping the street along the Arno river. I looked out my window onto the piazza below where the rain had not stopped falling since yesterday afternoon. The maltempo (bad weather) didn't affet the celebrations too much as we heard the botti di capodanno (New Year's fireworks) until late in the night and early into the morning.